Sizes of cakes and portions required. Type of cakes (Sponge, Fruit, Chocolate etc). Style and complexity of design. Whether sugarflowers or fresh flowers. Cake display (stacked, pillared or stand). Many other sponge flavours available from £10.00 per tier extra. 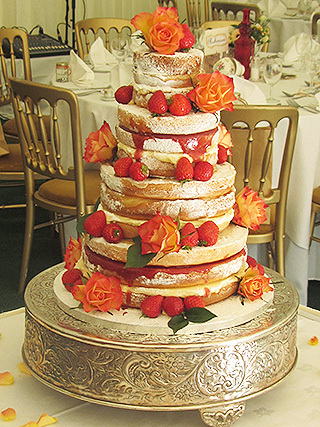 Different variations of naked wedding cakes are available including Seasonal Fruit and Flowers only. Naked wedding cakes have to be delivered and set up for freshness and we decorate at the venue only. See below for prices. Delivery and setting up from £30.00. Flavoured sponges and many filling choices available from £10.00 per tier extra. Homemade Rich and Light Fruit cakes available, please ask for prices.. Ask about adding a polystyrene dummy cake. All cakes are dowelled and boarded for ease of cutting and stability. A non-refundable £75.00 deposit secures the date of your wedding. Pillars are £12.00 a tier extra. Cake stands hired, £25.00 for a weekend with £100.00 deposit. Knives available for hire also.